In this two-parter, I’m going to talk about my own home project, how it evolved, and all the things that came into play to inform the process including finances, budget, life goals, pessimism, blind faith, and occasionally luck. Like many (most… maybe all?) of you, I’ve been dreaming of remodeling/fixing/adding on to my home since we moved in. When we bought our home, at the height of the market in 2007, we had just moved back to Portland after I completed my Masters degree in Architecture. Even though the market at the time was hot, we shopped for a house in a fairly traditional way – our realtor put together some listings and we toured a few properties on the weekends that fit the bill and then thought hard about the finances involved. This little 1950s-era cottage had a lot of what we were looking for – a good kitchen, a garage, a small lot (less to care for, lower property taxes), not far from the bike path, in a quiet neighborhood. The two bedrooms/1 bath seemed just fine for a couple with no kids and no real plans to start a family! Over the 10 years we’ve lived here, we’ve been through a lot in our little home – we did have a kid, at one point were deeply underwater on the house value after the market imploded (which also took out my great job at an architecture firm doing really interesting work), and we’ve put down roots with our neighbors and neighborhood. As we neared time for our kid to start school and as housing values came back it seemed like maybe a good time to “trade up” on the house. This time shopping for a house was totally bananas! The bidding process was: find a house that fits the bill, contact realtor same day (or respond to the properties she was sending me), drive by the house same day and arrange a tour, be prepared to bid asking or 25k over (or more) immediately. Ultimately we put 9 bids into play over two years and were overbid on every single one – sometimes by a little, sometimes by a lot. It was very frustrating but my realtor was great and she couldn’t have been working harder to get us into a new home. Eventually, the school question did get settled. My job also changed from working for other folks to working for myself. After number-crunching for two years and thinking about our lives, we just didn’t want to have the kind of mortgage payment every month that was necessary to “trade up” in this market. This is a deeply personal decision that everyone has to grapple with themselves – where to put your money. I could talk endlessly about the psychology of money but these are, for most of us, difficult decisions to make and there is no one right answer. In any case, we did decide that if we were going to stay put there was no better time to invest in our own home. My husband asked me at some point, “How long would it take you to come up with a plan?” I said, “You mean other than the amazing plan that I’ve already worked out in my brain and in sketchbooks countless times?” We started with what I like to call the 100%. I find this a valuable exercise for many life situations from going out to dinner to issues of greater enormity. What is the 100%? The 100% is what you’re asking for if you’re not afraid to ask for the entirety of what you want. Sometimes I get clients who ask for the 300% which is fine but we usually have to work our way down to something that is more manageable. Sometimes I get clients that ask for the 50% and I need to draw out of them what their whole vision is so we can see what we have to work with and where the project can go. Ask for what you want not what you think you can get. In any case, I took the three main “problems” with my house and made a design that solved them. Problem #1 – No foyer, no place to hang your coat. The front door opens right into the living room from the porch. There’s a big picture window to the left and a short length of wall to the right which has a heat register and light switches. I’ve never worked out any way to add a closet or even coat hooks that wouldn’t get in the way. Our coats hang on the back of the door to the garage in the kitchen. Our shoes are in a jumble in a big bucket by the front door. My vision was to push out the wall to the left of the door, into the front yard, by 4′ to create a space for a built-in bench with storage, an area for hanging coats/bags, etc. Problem #2 – No second bath, no office space. Two bedroom/one bath was a very efficient floorplan in post-war housing. But it feels a little constrained for modern times. We do more office work at home as a society and that’s true for us, too. I currently lease an office outside my home but I’d love actually to be home-based. While there are definite upsides to a separate office space, now that my kiddo is in school, it would be great to have that space at home where I could easily flex my hours. Ultimately, we really wanted a third bedroom and a second bathroom. While we were at it, we wanted to enlarge our kid’s bedroom to serve as transitional guest space. Our kid’s room is the most minimal size for a bedroom and a queen bed would fill the space. 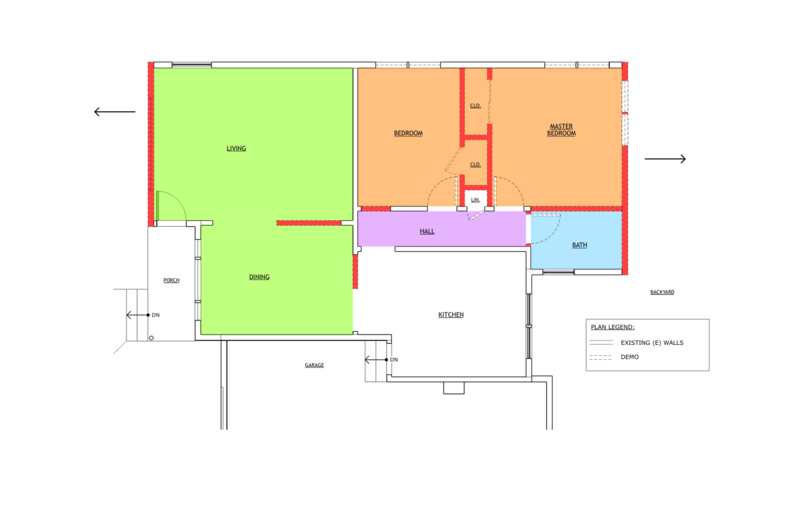 My vision was to enlarge that room, get a bigger closet in there, get a second room for an office, and then create a master suite with adjoining bathroom. Problem #3 – Better circulation. Circulation is how you move to and between spaces. We really wanted to open up the space between the living and dining so that we could have a little more elbow room. I like the idea of being able to turn the dining table, put in a leaf, and have some bigger gatherings. We also liked the idea of opening up the space between the kitchen and dining a little more. One of these walls is a bearing wall and the other has a significant floor transition (wood to stone tile). Below, you can see what this looks like in the demolition plan – walls in red were to be removed. Anything dashed (windows, walls) was also to be removed. The arrows show the two directions we were going – foyer to the left, master suite addition to the right. 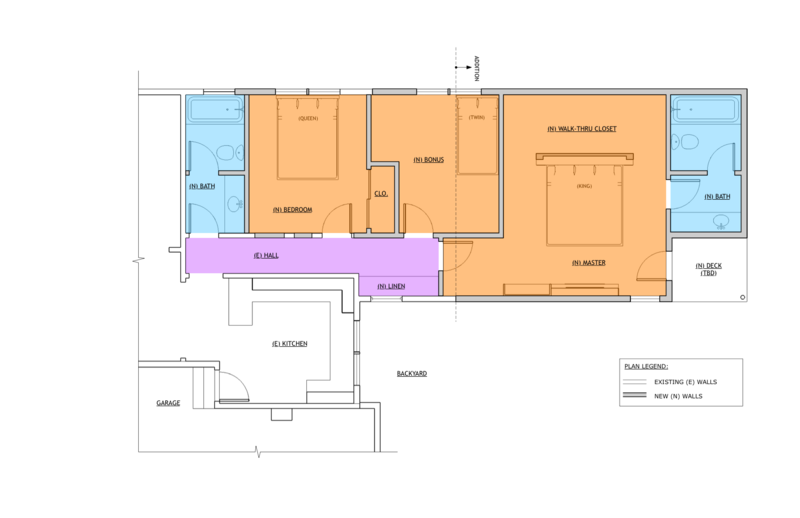 Green is living space, blue is bathroom, orange is bedrooms and purple is hallway (click to enlarge the plan, back button to return to this post). Here’s an enlarged plan of the front of the house and the fix for problems 1 & 3. I haven’t shown any of my (many) built-in options but there’s a number of ways to take a space like this and build it out. This would have also included new operable windows and shows the two walls at the Dining Room that would be altered to open up the space. The ceiling would need to be re-done and there’s also a concrete front porch extension. New hardwood flooring would need to blend with the existing. These and many other details that go into this space will – spoiler alert – make the price tag to add ~40 square feet of living space pretty high! 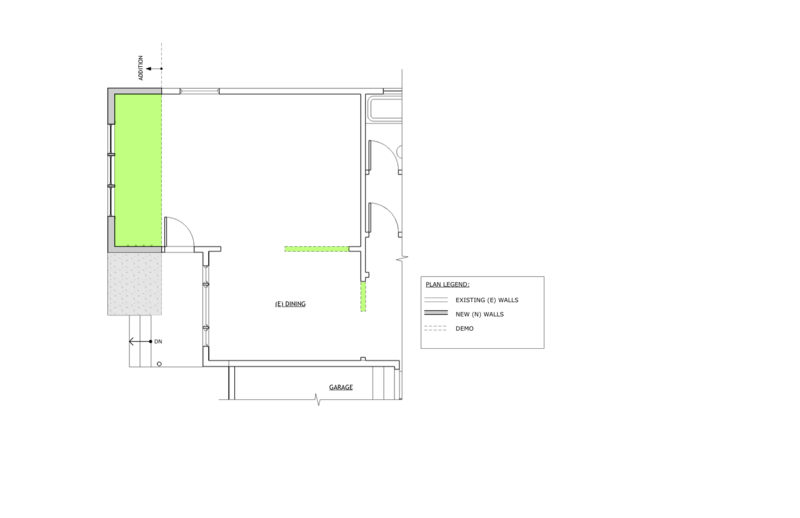 Here’s an enlarged plan of the back of the house interior remodel and addition. In order to access the space behind the existing house to add on a master suite while enlarging the two bedrooms, I had to blow through the existing bathroom, and deconstruct the outer wall. I put a new main bath right at the beginning of the hall which made a lot of sense for circulation path and would be a nice division between the public and private areas of the house. I sized one bedroom for a comfortable queen bed layout and the next bedroom for an office (twin bed shown). I was never totally happy with the master bedroom layout – it has a walk-through closet, full bath and a covered small deck leading to the backyard. 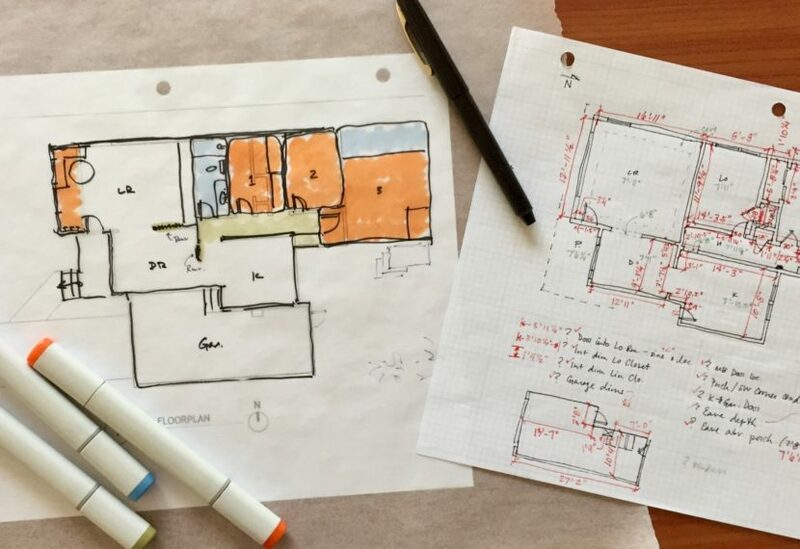 These are the plans we sent to pricing – I had a couple of contractors in mind that I wanted to work with and I knew the tag would be high but there were so many variables, I wasn’t quite sure where we would land and how we would prioritize any changes we might need to make. In part 2 we come up with plan B!